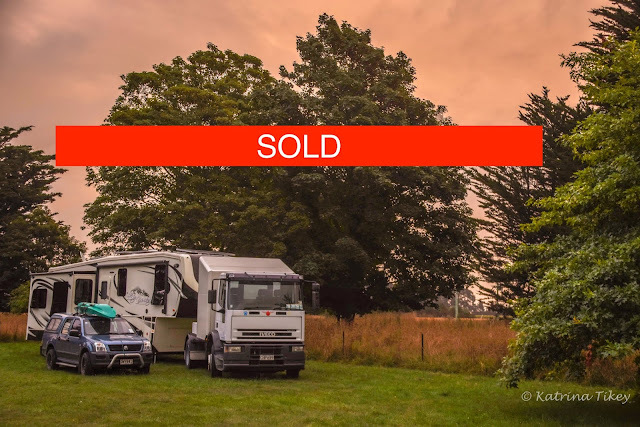 The rig and truck have sold. The new owners are very happy with their purchase and we are relieved to see it go to a lovely North Island couple (Len & Lesleigh). (a Keystone Bullet) which they towed with a Ford Ranger. They wanted to buy our fifth wheel and truck by giving us their fifth wheel and tow vehicle plus a cash difference. 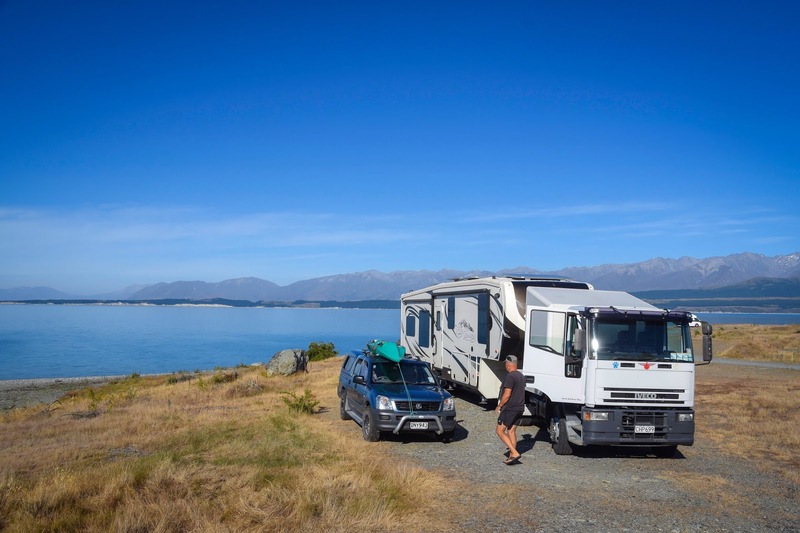 When they first suggested this we weren't keen because we didn't really want another fifth wheel. Our plan was to buy a block of land and a small bus. 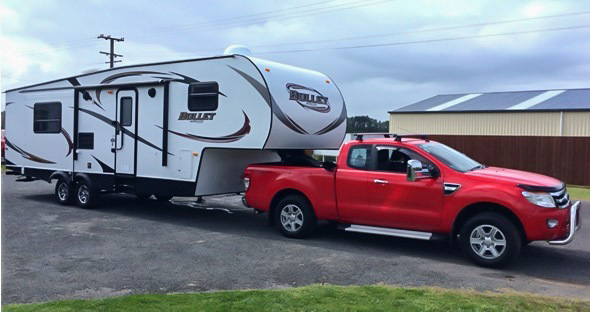 However after we had time to think over the idea we decided to go ahead with the swap because we figured we could sell the smaller fifth wheel & ranger ourselves. Being a smaller and less expensive unit we thought there would be a bigger market for it and perhaps easy to sell on. So we agreed to the arrangement. Then .... we got a phone call from Len saying as he was towing his fifth wheel to Wellington (so our friends Paul & Amanda could have a look at it on our behalf), he was hit by a massive gust of wind which pushed him off the road and flipped him into the ditch. 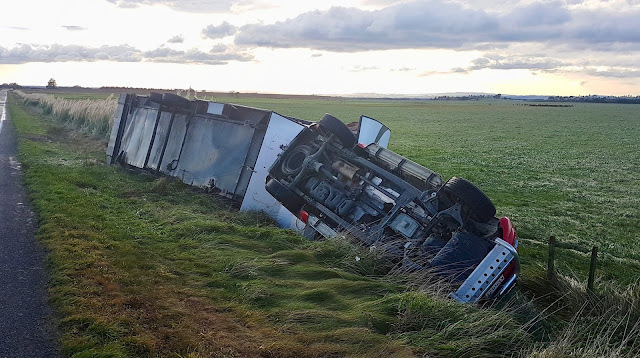 Fortunately Len was not injured although his poor wife who was following him in another vehicle saw the whole thing happen and was pretty shaken up! 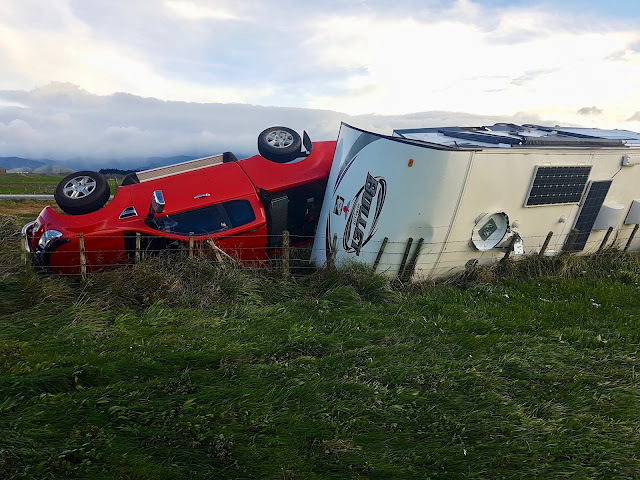 The insurance company wrote the rig off. But there is a positive side to the story - Len was paid out by his insurance company, and then able to do a straight cash deal. Perfect for us! So it's farewell to our rig. Onwards and upwards. We've just bought a stunning block of land (smothered in native bush) that we both fell in love with. Bernie is fizzing with ideas of what he will build on it and I'm busy hunting for a small bus or caravan so we can continue exploring. Look forward to seeing where you go from here. Thanks :-) Yes, Len was really lucky he walked away from that! Flipping heck, what a fright so be tossed by the wi d lime that! Congratulations on your land purchase, and do let us know when you find your bus and start doing trips again. Oh wow! Scary to get flipped like that, but so good no one was hurt. And it all worked out for the best in the end.